I have a small collection of Thomas Rowlandson prints for sale. They can be viewed by clicking on the link to the Prints for Sale page at the top of the screen or by clicking here. The sale page will be a new permanent feature of The Printshop Window and I will post an update on the main blog when new items are added to my catalogue. The founding of the British Museum was undoubtedly one of the great cultural achievements 18th century England. It was the world’s first recognisably modern museum; a state-owned institution that was open to all, collecting objects drawn from every major branch of the arts and sciences. The Museum’s collection was initially based upon the 71,000 antiquities and other items that had been left to the nation by Sir Hans Sloane on his death in 1753. The precedent set by Sloane was eventually followed by other wealthy Georgian collectors, including King George II who donated a portion of his library to the Museum in 1757, and the collection rapidly grew to include countless valuable objects, manuscripts and works of art. The Museum’s collection of prints was initially a rather modest affair, consisting of a small quantity of engravings after the Old Masters which had belonged to Sir Hans Sloane. However the death of the print collector Reverend C.M. Cracherode in 1799 resulted in the Museum inheriting over 10,000 16th and 17th engravings. The size of the newly acquired collection was such that the trustees were required to clear a whole gallery in order to house it and to appoint the Reverend William Beloe to act as the British Museum’s first curator of prints and drawings. 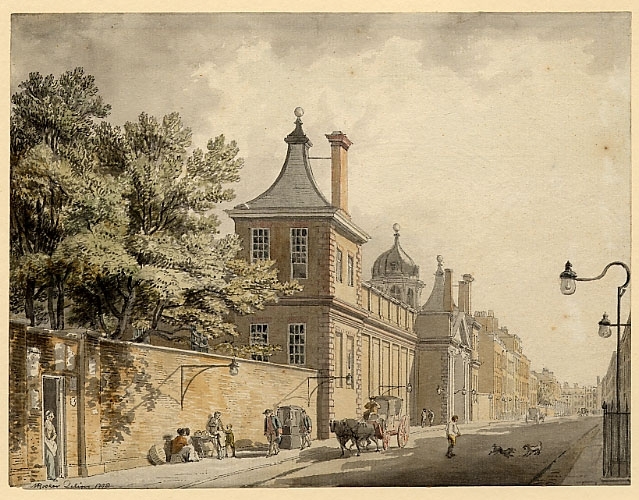 The scene of the crime – Montagu House, the original home of the British Museum c.1800. It is at this point that the caricaturist Robert Dighton enters the story. Dighton was an enthusiastic collector of old master prints and had been visiting the Museum on a regular basis since the mid-1790s. He was introduced to Beloe shortly after the Print Room opened in 1800 and seems to have gone to great lengths to strike up a friendship with the curator, even going so far as to present the good Reverend with several of his own prints and watercolours as gifts. By 1804 the two men had become firm friends and Beloe was perfectly happy to allow the caricaturist to turn up at the Print Room whenever he felt like it and peruse the collections without supervision. Unbeknownst to Beloe however, Dighton had begun using these social calls as an opportunity to steal rare prints. For a period of about eighteen months, from 1804 until 1806 Dighton would regularly take a folio containing his own draws into the Print Room and then use this to smuggle out prints he had taken from the collection. The crime was eventually detected in 1806 when Dighton sold a stolen Rembrandt to the printseller Samuel Woodburn of St Martin’s Lane. Woodburn showed the print to a friend, who declared it a forgery and the two men immediately headed off to the British Museum to settle the argument by comparing it with the original. When they arrived at the Print Room and found the original copy missing, they immediately alerted a senior member of the Museum’s staff. Within days rumours of the thefts were circulating in the press and an embarrassed board of trustees was forced to hastily convene a committee of inquiry to look into the matter. Woodburn was called to appear before the committee on 21st June 1806 and confirmed that, not only had he purchased the stolen Rembrant from Dighton earlier that month, he had a number of other prints in his collection which he suspected had been lifted from the British Museum by the light-fingered caricaturist. After leaving London in the disgrace, Dighton spent a considerable amount of time in Oxford and produced several caricature studies of noted local connected with the university. With several other printsellers lining up to confirm that Dighton had sold them suspect prints and Museum staff also coming forward to testify that Beloe had been only too happy to allow his friend to have free-reign over the Print Room’s collection, it was only a matter of time before the caricaturist’s guilt was established. 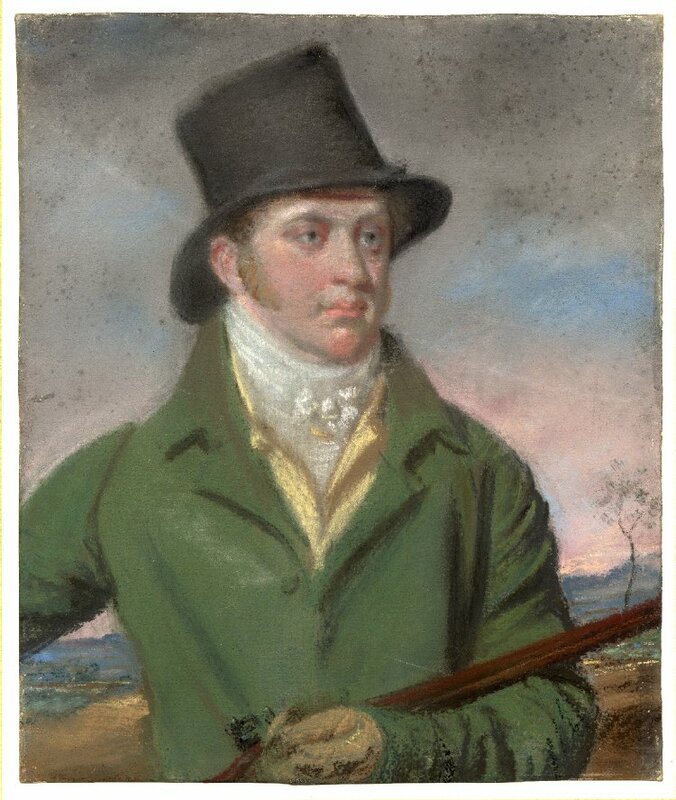 At the end of June 1806 Dighton panicked, came forward, confessed to the thefts and offered to cut a deal – He would return all the stolen prints he still had in his possession and help the Museum track down the dozens of items he had sold, as long as the trustees agreed to drop their plans to prosecute him for the thefts. Dighton got lucky. The trustees had to strike a deal because they had no other means of recovering the missing prints. Beloe had never got around to cataloging the collection and therefore only Dighton knew precisely which items were missing and where they had gone. He did not escape scot-free though, word of the scandal soon leaked out and the damage it did to his reputation was such that he was forced to give up all hope of finding work as an artist in London for years to come. Robert Dighton eventually left the capital in late 1806 and spent a number of years travelling around the Home Counties trying to find work as a jobbing artist and engraver. It is to be hoped that his former friend’s downfall provided some small crumbs of comfort to William Beloe, who was left to bear the full force of the trustees anger and instantly dismissed from his post on the grounds of gross negligence. As far as we know neither man ever set eyes on the other again. Don’t tell me of Major Semple! Had you found yourself sitting in the public gallery of the Bow Street magistrates court one afternoon late in the winter of 1801, you could have been forgiven for asking what the proprietor of a public house in the small West Yorkshire town of Ferrybridge had in common with the captain of a merchant vessel recently returned from Jamaica; a Lieutenant Colonel in the British army; the landlord of another pub in York; and the faithful retainer of a noted Whig MP? The answer would have been that they were all aliases of the prisoner standing in the dock in front of you – Thomas Ogle, a conman who had been praying on Londoners for the best part of a decade. Ogle was originally from the small village of Hemsworth in West Yorkshire and had probably arrived in London sometime during the 1780s. He was initially employed as a servant, but domestic servitude appears to have been particularly ill-suited to someone of Ogle’s temperament and he eventually found himself unemployed and cast adrift on the streets of the metropolis. With only his wits and considerable guile to sustain him, Ogle soon realised that there was good money to made by parting his gullible southern neighbours from their cash and over the course of several years he rapidly descended into a life of wanton criminality. Ogle’s modus operandi differed from case to case. In some instances he would concoct elaborate backstories in which he presented himself as a respectable businessman or a military officer who had fallen on hard times. In others, he would simply walk into a shop and claim that he was the servant of some well-known society figure and had been asked to purchase goods on their behalf. The end result was always the same: once the victim had handed over their money or valuables, Ogle would vanish in London’s crowded streets, never to be seen again. He was eventually arrested in October 1801 and convicted on the basis of evidence provided by Richard Wrangham, a Bond Street stationer who had supplied Ogle with a quantity of expensive pocket books, believing that they were destined for the hands of Charles Wentworth MP. This is one of a number of courtroom portraits produced by Gillray and other caricaturists like him in this period. Caricaturists were considered to be particularly suited to this type of commission as they were adept at rapidly capturing an accurate likeness of their subject and were cheaper to employ than a traditional portrait artist. The print is headed with the following quote from John Townsend, the Bow Street Runner who had been responsible for Ogle’s arrest: “Don’t tell me of Major Semple! Why Major Semple’s no more to be compar’d to this here Rascal than I am, to my Lord Kenyon or Buonapartè!” Semple was a notorious conman and thief but had been highly regarded by the public due to his distinguished military career and dashing adventures across Europe. Clearly Townsend thought that any attempt to draw a comparison between the gentlemanly Semple and a grubby swindler like Thomas Ogle was beneath contempt. 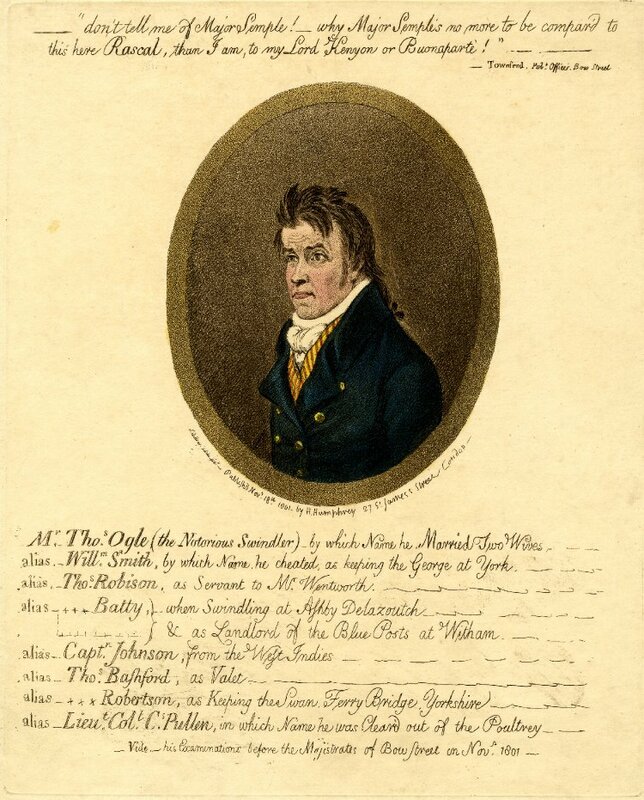 Gillray’s stipple and aquatint portrait matches the brief physical description of Ogle provided in the court records, which state that he was 5’5 tall, with dark hair, grey eyes and a Yorkshire accent. It is accompanied by a list of Ogle’s known aliases and the crimes he is thought to have committed whilst using them. The date of publication is somewhat confusing, as the print claims to have been based upon evidence given at Ogle’s “examination before the magistrates of Bow Street in Nov 1801”. However the newspaper accounts of Ogle’s arrest indicate that his hearing at the Bow Street magistrates court took place on 15 October 1801, just over a month before this print was published. That would mean that either a second hearing took place in November which was not reported by the press, or that Gillray applied a bit of creative license in order to make the print appear as though it had been published immediately after the event. Thomas Ogle was found guilty of fraud on 5th December 1801 and sentenced to seven years transportation. He would spend the next twelve months languishing in a cell in Newgate prison before eventually being dispatched to Australia. I have been unable to locate any further records which indicate what may have happened to him after that, although the registration of the death of a 60 year old man named Thomas Ogle in the parish records for Lancaster in 1822, hints at the possibility of him serving his time on the far side of the world and eventually making his way back to the north of England. 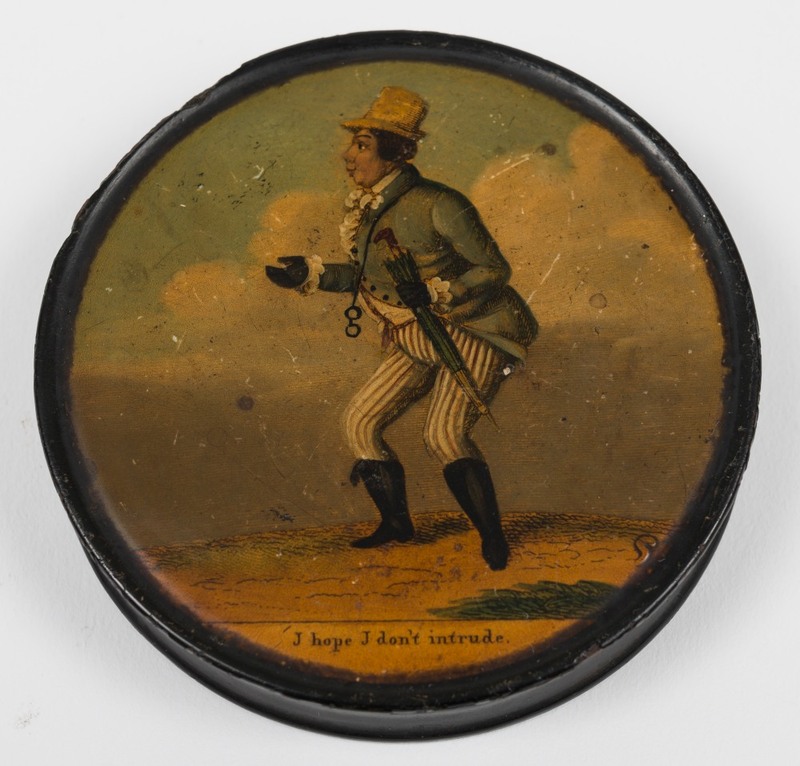 Following on from our last post, here’s another piece of caricature-related merchandise from the early 19th Century. 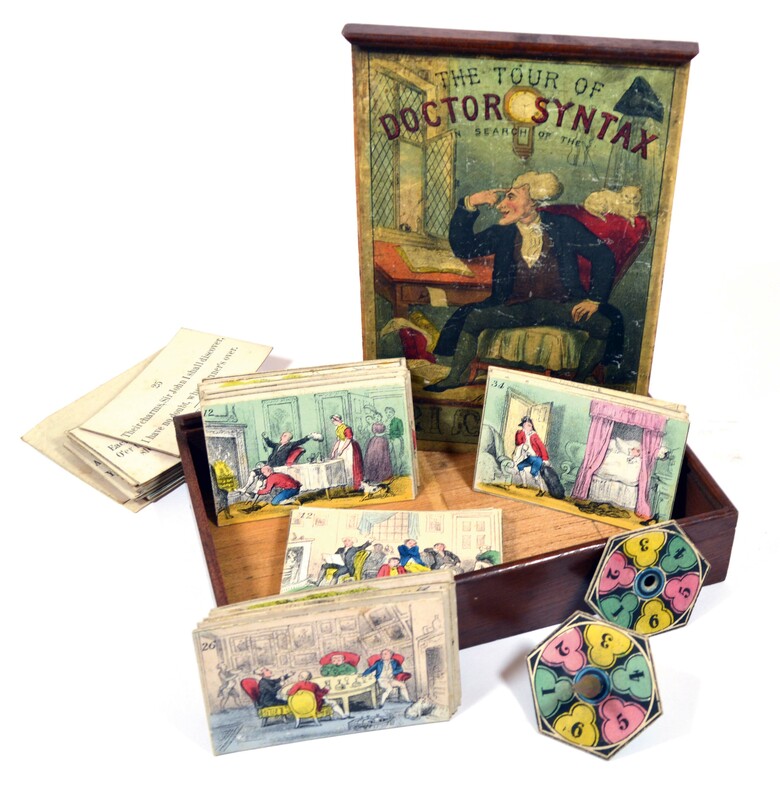 It’s a game based on William Combe and Thomas Rowlandson’s The Tour of Doctor Syntax in search of the picturesque (1809 – 1812) that was probably produced sometime around 1830. It consists of two packs of numbered cards, one carrying lithograph-engraved copies of Rowlandson’s original illustrations and the other exerts from the text. Players would spin the coloured wheel to select cards from each deck and try and match the text to the appropriate illustration. It’s no PlayStation, but probably seemed pretty swish in an era in which the cup and ball was at the forefront of home entertainment. The game will be going up for auction in the UK in a couple of weeks. The auctioneer has put an estimate of £200 – £400 on it which seems perfectly reasonable. It’s hard to put an accurate value on items like this because so few of them have survived in such good condition and they rarely come up for sale. In this case, the game appeals to a couple of different groups of collectors, which is always a bonus as far as value is concerned, so it’s possible it could exceed the top-end of the estimate. It’s one I’ll be keeping my eye on. This small black lacquer and papier mache box is an early example of the sort of tie-in merchandise that now appears in connection with just about every mainstream movie, TV-show and musical group that comes along. In this instance, the design is derived from the hugely successful stage comedy Paul Pry, which first appeared at the Haymarket theatre in September 1825. The play was allegedly performed to some 200,000 people in a mammoth first season that ran for well over a year. Performances were sold out months in advance, with touts selling tickets for seats in the pit at prices that one would normally expect to pay for a private box. Within a year of its first appearance in London, Paul Pry was also being performed in New York and by the end of the decade had reached as far afield as Sydney, Australia. Paul Pry’s popularity rested upon the audience’s love of the eponymous lead character – a bumbling busybody, who was forever sticking his nose into other people’s business and offering advice where it wasn’t wanted. The figure of Pry became instantly recognisable thanks to his trademark umbrella (an item which he often deliberately left behind him in order to provide an excuse to call back on an unsuspecting host) and use of the catchphrase “I hope I don’t intrude!” The character was initially performed by the great comic actor John Liston (1776 – 1846) and it was Liston’s mannerisms and choice of costume that would define representations of Paul Pry for the next fifty years. Pry’s image was reproduced extensively on all manner of consumer goods, including caricature prints. 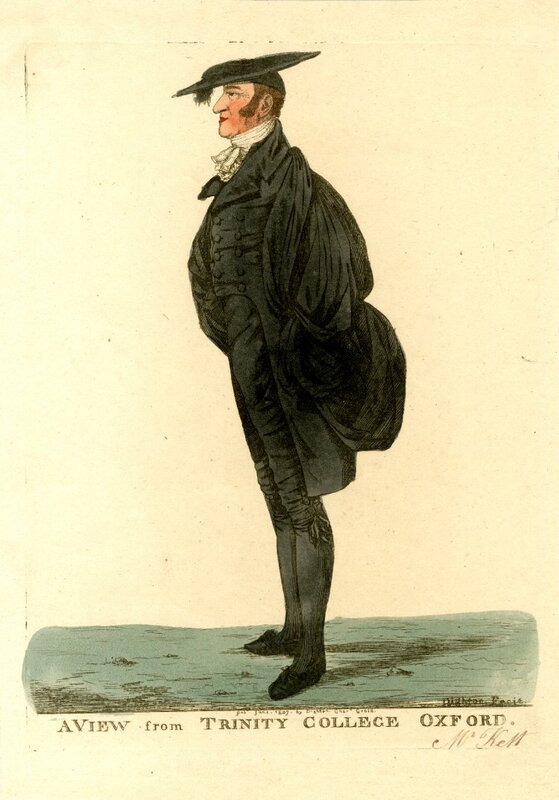 Caricaturists appear to have been especially fond of Pry, using him as both a comic device within the narrative of their own designs and an emblem of the satirist’s own desire to ‘pry’ into affairs of state and the lives of those who moved in London society. The caricaturist William Heath family adopted Paul Pry as a pseudonym and began signing his prints with a small picture of Pry, umbrella in hand.